Fuel cell buses currently operate in London (run by Transport for London) and Aberdeen (looked after by Stagecoach and First Group), having entered service as part of the EU’s High V.Lo-City and HyTransit projects. At their peak, there were ten buses running in both locations, and the reactions from operators and passengers was positive, with no major issues being reported. In addition, the CHIC (Clean Hydrogen in European Cities) programme was hailed a success when it concluded back in 2016. There has to be a minimum of five different cities in different countries, she explains, adding that there are ten countries involved across the two schemes: UK; Germany; France; Denmark; Iceland; Norway; Sweden; Netherlands, Latvia and Italy. The biggest difference between the two programmes is the purchase price of the buses. Having seen prices fall from the €1.2 million back in 2008, JIVE introduced a cap of €650,000 for each bus, with JIVE 2 taking it one step further to €625,000 for 12m-long buses. Participating OEMs include ADL, CaetanoBus, EvoBus/Daimler, Safra, Van Hool, VDL and Wrightbus. Sub-suppliers include Ballard, ElringKlinger, Hydrogenics, Luxfer, Proton Motor and Siemens. In total, there will be 300 buses across the two projects – roughly equal numbers between both, says Skiker. “In past projects, we talked about very small fleets – typically three to five buses for each city. The largest deployment was in Aberdeen, which had ten buses,” she explains. “But for these projects we are going much larger – so in Cologne there will be 30 buses and most of the others will have at least ten hydrogen vehicles. JIVE 2 will place 12 in Dundee and 20 in Brighton. In addition, three extra buses will be placed in Belfast and 25 in Bootle, Merseyside with UK funding. A related €5.5m project, Mehrlin, will install seven hydrogen bus refuelling stations around Europe, including in both Birmingham and London to supply the JIVE buses. The fuel cell module order from Van Hool was for 40 FCveloCity-HD 85kW units and was, according to Ballard, the largest order ever for fuel cell buses in Europe. The system will also feature a 210kW Siemens PEM electric traction motor. “Transit buses are an excellent example of a strong fit for fuel cell technology, which is able to meet the key requirements of long range, rapid refuelling, heavy payload and full route flexibility,” says Rob Campbell, Ballard’s chief commercial officer. The Cologne and Pau operations will begin in September/October 2019, the same time as ebe Europa-supplied fuel cell buses take to the streets outside Frankfurt. While deliveries will be made over the summer, there will be a ‘settling-in’ period. “What we found out from previous projects – which I was also involved in – was that the buses needed time to adapt to the route and the telemetry,” says Skiker. The Van Hool buses are designed for 29 seated passengers and up to 49 standing. Thanks to the hybrid power source, they will be able to carry out a full day’s schedule of 350km (217mi). The tank capacity is 38.2kg of hydrogen, with typical consumption (helped by the re-use of braking energy) at around 8kg of hydrogen over 100km. Skiker believes the technology will complement battery buses in fleets of the future. “If you need up to 200km [124mi] of range, then a battery bus would make sense, but if you need a longer range for inter-urban traffic, travelling hilly routes or when running in winter, then the fuel cell is the better option,” says Skiker. 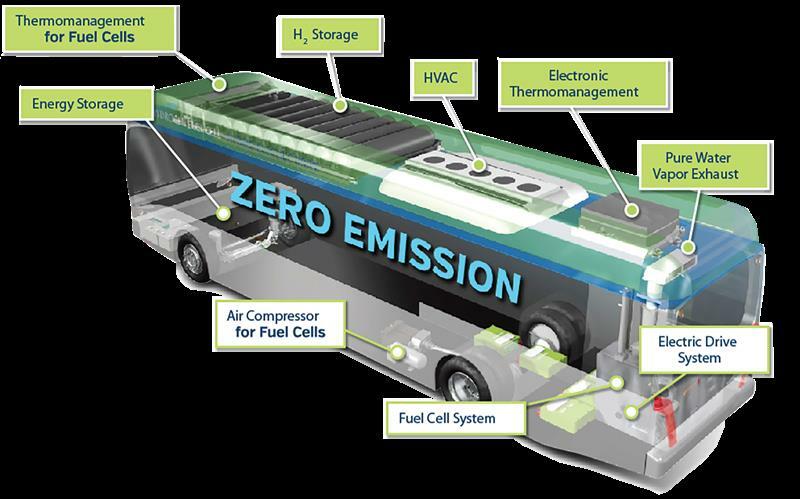 “Also, there is no diesel generator required for heating in hydrogen-powered buses, because they can use the heat recuperated from the fuel cell. “A lot of the decision will also be down to cost, but we have seen indications of fuel cell bus prices falling to €450,000 [£385,000], which is comparable with battery buses, so that will be a game-changer,” she says. “Cologne is investing in battery buses as well as being a part of JIVE,” she adds. Another example is Norway, which had a battery-only policy for many years, “but now they are part of our project because they realise that EVs do not solve all of the problems”.